This mysterious nebula, catalogued as RCW 130 and Sh 2-10, lies in the direction of the Sco OB4 association. Two Wolf-Rayet stars, WR 86 and WR 88, are visible towards its edge. There is little visible in IRAS or MSX infrared but there is significant radio emission in this direction. You can see this nebula in the context of the bright stars in the Sco OB4 association here. Avedisova lists three ionising stars: the O8 III giant HD 155806, the O9 IV subgiant HD 155889 and the B1 V main sequence star HD 155754. Curiously, Sharpless mentions none of these as ionising stars, listing the O-star HD 156327 instead. SIMBAD says that this last star is in fact the Wolf-Rayet star WR 86. The RCW catalog adds the not-very-helpful note that RCW 130 "Appears to be a more concentrated region of a large area of diffuse emission". However, both Avedisova and Russeil gives distance estimates of about 1000 parsecs for Sh 2-10, and the best distance estimate for WR 88 is 2330 parsecs. WR 86 does not fare any better - the distance estimate for it is 2860 parsecs. 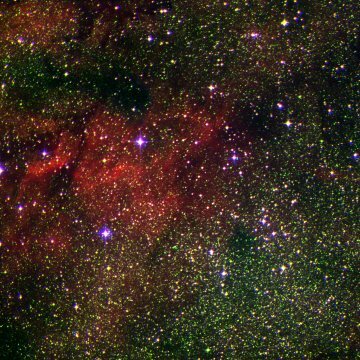 It appears that neither of these Wolf-Rayet stars is associated with this nebula unless it is more than twice as distant as the available estimates suggest. There seems to be no high quality images of Sh 2-10 currently available. This SuperCOSMOS image (unfortunately bisected by an obvious plate boundary) reveals the full extent of this large faint nebula.